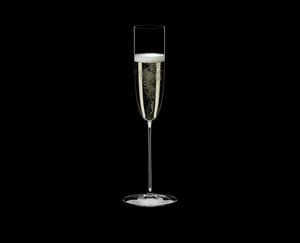 The elegant handmade Champagne flute of the first-class glass collection RIEDEL Superleggero is a luxury item for everyday use. This classically shaped glass is often used for light, fresh, dry champagnes. However, this shape is the choice of those connoisseurs who choose their glass from an aesthetic point of view. The RIEDEL Superleggero series is lead free and features slimmer aesthetics and super light design - as reflected in the name. To celebrate the unique glass series the designation of the series can be found on the base next to the RIEDEL logo. Riedel Superleggero (2015) is a grape-varietal specific crystal glassware series and a revolution in handmade glassware, with finer aesthetics and improved lightness – as reflected in the name itself. With a slightly adapted shape and stem length, it is the perfection of the original Sommeliers design. Following the Riedel philosophy of ‘form follows function’, all Superleggero glasses are primarily ‘tools’ designed to enhance the enjoyment of fine wines. For the first time in Riedels history, the designation of the series can be found on the base of the glass next to the Riedel logo.